A new cosmic gift is presented to us with a fresh and at the same time Fiery New Moon at 15 degrees of Aries, for us to break free from what keeps us small, living in the past, and begin to regain self-empowerment, and strength to continue with our evolutionary journey. The Aries New Moon on April 5, acts as the catalyst for us to align with the energies of initiation that this month introduces, and that will reach its completion in May. This is a month that indeed invited us to create change through conscious action. However, in order to do so, first we need to create this same shift from within, which is what April reminds us. This is a time to mold, from within, a space of clarity and alignment with our soul, the creations that we will birth during the following months. To be able to bring forth outcomes that are One with our God Will, first we need to take some time in contemplation, for we no longer create from a space of impulsiveness and egoism. 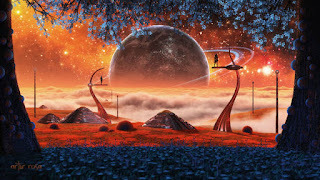 This is a Moon whose main alignment, as it square Saturn, makes of it a wonderful one to taste our patience and to help us slow down in our egoic tendency to control and act, when it is not time yet to do so - observing, from a higher perspective, where we are going with what we are already creating. At this time I cannot emphasize enough the need for us to take a break, to create a balance between BEing and acting, for the line is fine and we may rush into the process of creation. One that needs time, patience and constant nourishment, something that can only be done by being in a total state of surrendering and alignment with our Unified Self. If you follow traditional astrology, which is perfectly fine, you will be told this aspect is a challenging one. However, my personal experience with certain astrological aspects is simply one of moving inward to truly feel the energies for us, without human interpretations, and to be able to discern their nature, before we can attach to them any human meaning. This aspect can only defy us to cultivate patience instead of the human tendency to act imprudently, and that, even though hard for many, it is never a challenge or a curse, but a cosmic gift for us to master ourselves and create inner peace and alignment, where our egoic self creates anxiety and desperation for being constantly searching outside, instant gratification. Beyond our earthly confines, this is a Moon whose connection with Andromeda is going to bring many stellar memories for many of us. For the ones who are working with embodying more galactic wisdom or simply on the conscious remembrance of their origins or the knowledge they need, at this time, this will be a wondrous Moon, for us to align with the Essence from all this micro and macro alignments, encounters that are made to open galactic doorways, stellar connection that goes beyond our perception of the Moon and the Planets, and that we can align with, if we know where to look. We are immersed within a very creative passage, where it is pivotal to focus our intention on our soul desires to build rather than doing it without the proper clarity. This is a month for us to surrender, until the perfect moment for manifestation comes. All previous cycles in the aforementioned manifestation, must be respected, for all of them hold the key to give birth to outcomes that are aligned with our unique path, something we cannot obtain, if we act impetuously. During the periods between giving birth and finally seeing our creations in the physical, it is important to hold the vision of what we wish to build. There are many tools for us to keep this vision and focus only in the image and feeling of that which our soul desires. Creative visualization is vital if we desire to release egoic fears and doubts and try to be, at all times, only feeding, through conscious light input, our original soul vision, of what is being already built, in the non-physical realms. This is one of the many exercises, and easy one to make as well, that I use for my personal journey. However, it is very powerful, for ascension, on the contrary of what is often thought, is all about simplicity. There is no need to complicate what is in itself part of our nature, as Divine beings. I was guided to share a visualization I do, daily, when I am in the process of bringing something into form, between other things, in case it can help you in your path to conscious creation. As always, make sure you are in a peaceful state of being. Prepare your sacred space and ask for the protection of your Unified Self and Guides. Do it in your unique way, use the tools (crystals etc.) that feel best for you, for we are all unique and we all have different connections beyond the main one with our Unified Self, so what may work for one may not for another. Sit comfortably, if this feels good for you, for me it only works sometimes, other times, I have to walk, or go to swim, if not, it will not work, but many people cannot be still, if they do not sit properly, which is also very good for our spine. So as you can see this is something you will have to ask yourself, and body, and do as guided. Then commune with your soul. Quiet your mind and its egoic noises. For it is pivotal for you to listen to the whispers of your souls. Then, once you truly know that the inner voice you are listening is the one coming from the wisest aspect of you, ask your Soul or Unified Self, as you prefer to call it, as for some it will be more comfortable to use the term soul, what it desires to create next, and that will be aligned with All. When you receive the vision, become the witness of your own human experience and of the desire you just received. This is very important for you not to confuse yourself with you egoic desires. If you are one working on mastering your ego and know how to differentiate both, then this will not be a hard task. However, if you are beginning on this path or conscious evolution and assistance, you may not be so sure yet. The egoic desires are those who feel good to us but that will not take others into account, for it only cares about the self. Soul desires, especially if you are beginning, may feel uncomfortable, at first, and you can even show resistant, for they are not meant to help only yourself but All. However, as you evolve, you will eventually become One with your Soul desires. This is the main difference and deep within ourselves we do know from where our desires come, we just have to be humble enough to recognize this to ourselves. When we finally have ou soul vision clear, is then the time for us to begin the creative visualization exercise that in my case I do for at least 21 days. Sometimes it is not even necessary for it manifest before the 21 days end, others do not. It is all as my Unified Self orchestrates it. My mission is to help and be the bridge for my Unified Self to manifest what will serve All, in this physical reality. That is all. When you hold not just the vision of your soul desire but the feeling of how you feel by creating something that will serve your path, that of All, and that will enrich your soul, then we are going to use the God Pattern, as I call it, which is universally called: Tree of Life, to do the exercise. Before going further into the exercise, I would like to explain that there is a lot of confusion with the so called Tree of Life. To me, the True Tree of Life shall represent the 12D, between many other things. So I will not follow the other tree of life structures, which to me are reversed versions of the authntic one. As you know, another manipulation from the negative agendas. So I will use what I have been told is that the authentic and universal Tree of Life, what I call the God Pattern. As always, follow your own guidance about it. I refer to it as the God Pattern for it is how I received it, we all have our own words to understand how Creation is built, and it is the pattern that lies behind everything we see with our physical eyes. although it is a bit more complicated than that. It is within ourselves - micro - physical reality, Planet, Universe - macro - and in everything that Source gives birth. You are going to paint it yourself, as bigger as you desire, if it is possible, if not simply find one and print it, for we are going to work with it. The explanation my Guides gave me is that if we truly desire to affect/transform anything, first we have to go to the core of it, and begin to create the change within it. This is the basis of everything, and therefore, it is where we shall go whether we wish to shift something, heal our bodies or anything else we desire to birth or shift. As you know, each number and color represents not just a physical part of our body, but also our connection to its macro structure. For example the first and red one, represents not just our first chakras but also the 3 dimension, as well as the second and third ones. So if we desire to affect certain parts of our bodies or reality that resides within this spectrum of light, for everything is light, we have to infuse this God Pattern, in the specific part we desire to bring this change, with our pure intention, and hence, though or vision, of what we desire to create now. Thoughts are energy, and hence have an impact as well as our actions, which are consequences of the first ones. When we concentrate thoughts, feelings and actions, infuse them with light and send them into this God Pattern, speaking aloud, we begin the conscious process of creative creation, for we have already visualized and what we are doing now is to give birth, in the non-visible planes to what will manifest, at Divine Time, in our physical one. So once you have the God Pattern with you, you are going to write on a piece of paper your soul desire, or directly on the part of the pattern that you wish to work with, and put it on top of the God Pattern, in the specific part that you desire or near it. For example if you desire to release a 3D pattern you will use the aspect of the pattern related to the 3D, the same goes if you are working with a certain part of our body, we will use the numbers and colors that belong to what we wish to change or heal. If what we desire is to communicate with the Illumined Realms or simply any other beings, we can use the higher parts of the pattern or the entire one, depending on what dimension we desire to make contact with. 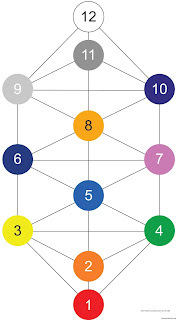 If what we desire is to anchor ourselves within the fifth dimension or second harmonic universe, for it is the same mainly, we will begin to work with numbers 4,5, and 6, which represents the fifth dimension. Of course it will not work if we do this but then we do not walk the talk, which is essential. If we work with any other thing that is outside our time-space, then we shall use the numbers 10,11, and 12, for it is a timeless zone. You are going to infuse the piece of paper with your thoughts, emotions and the physical act or putting your right hand upon it first and later on by saying your desire aloud or chant it, as you prefer, with your sound tools, if you can, and we all can for if we do not have sound tools, we can simply use our voice, which is enough. We can take the sound tool that best resonates with us and begin to say/chant how grateful we are for what our soul is creating and we are simply anchoring, in our human dimension. Welcome any symbol you may receive, numbers, light language or any other thing that comes to you. If not, it is perfectly fine, just embrace stillness. Keep chanting or simply playing your sound tools as you visulize your desire already existing, for it is already descending, from the non-physical worlds, for as long as you are guided. After that, be grateful for you have been assisted whether you can physically feel it or not, and put in the pattern with your desire in a drawer or in some place in which it is safe. This is something you have to internalize too, for the physical drawing of the God Pattern in a piece of paper is for your human self to connect, for the human needs to create sometimes a certain enviroment as well as the feeling of being connected, physically, to something that will support its internal task. The physical ceremonies (I prefer this word than to call it ritual, as for me it is a way of honoring more than truly making something happens) also do their functions, of course, but only once we have infused it with our light essence. In truth, this patter is within us and it is there where we have to go and talk to it, consciously. Be patient, there are times where we do not know, for we cannot, or will simply not understand, and the desire cannot come at this time or tend to delay, for our human self. Whatever happens, now that this is a blessing for you and that all occurs according to a Divine Plan that we many not comprehend but that is what All needs for our evolution and protection. Beyond our limited human sense of space and time, and beyond what the essence of this New Moon represents for us, in our micro planetary system, there are infinite other events taking place, at the same time. Ones that are not separated from this New Moon but that are connected to it, if we know how to see beyond our cosmic events and be open to receive other energies that come from outside our Universe, to assist us in this transition. During the New Moon there is going to be a wonderful aspect, for it aligns with the Star Alpheratz, the brightest star within the Andromeda constellation. The Galactic Core of Andromeda is very connected to our Galaxy core, as it is assisting us to evolve. This is not the only connection to our twin Galaxy, for Andromedans energies abundantly flow as well in the Sirian Giza portal. These frequencies are going to help us in many things - depending of where we are in our evolutionary journey and what we need to master/remember. For some, these energies will be about re-memorizing ancient memories and their star lineage, for many of us come from other dimensions or civilizations, or are related to it, as the Creators Races are directly connected to Andromeda too. However, this will give many who are beginning to awake to certain memories from their original galactic families, the opportunity to embody this knowledge and use them for their personal growth, for we all need to feel the remembrance from the Illumined Realms from where we originated, from time to time, as a reminder that we are never alone and that we are always being watched by beings and forms of consciousness that we cannot imagine. For others, who are simply on a different stage of their ascension path, they could take advantage of this alignment from this New Moon by working with accepting change, as we are now immersed in a creative passage in which many of us are transforming old worlds and giving birth to new ones. Andromeda beings and the galaxy in general, is a totally different reality from ours. Their reality is constantly shifting as they also shift their thoughts. Nothing is ever fixed and limited from their minds to their "physical" reality and they do no live attached to a certain way of living or ways in which things should be, for they are accustomed to be in a constant state of change. This is something that the majority of us are still mastering, for when change comes, whether we have created it or we think we have not, especially if we think we have not, even though as conscious souls we know we have done it anyway, we are reluctant to let things/people go and being anew. We get attached to how things were, to our partners, to how we used to be, and to anything that reminds us what we possibly consider to be better times or at least familiar ones. If you are immersed within a shift, call upon this energy and/or beings, if guided, and they, even though, or at least at the beginning, can seem challenging to feel these energies, for they are very potent ones, know that they have listened, received you petition for assistance and that if it is within your soul plan, for as you know there are some things that we have to fulfill that cannot truly be modified much, they will assist you, at the same time that will honor your path, to accept change, create a new reality and be at peace within it, something that is very hard for humans. Many at this time may be feeling the crumbling that is taking place within themselves, due to the energies of March, ones that have helped many to emotionally release that which belongs to the old and was impeding them to embrace a new beginning. If during this time you are still experiencing a deep emotional breakthrough, know that you are where you need to be. You are healing, you are evolving, and because you are having this emotional release is that you will be able to grow and embrace a New You. We all have our own soul plan, with our own time to realize and dissolve feelings and old situations/energy. Comparisons only show us that we have not yet mastered the egoic self and that there is more inner work to do. There is no need for you to feel as if you were not where you desire to be or as if you are less ascended than. It is precisely when old worlds collide and smash that a powerful transformation begins, one that will lead us to finally break the walls we have created ourselves and begin to regain the cosmic memories we all have within. It is important that you nurture yourself if you are passing through this period of dissolution of the old. Your body is constantly eliminating toxins, which is how we see old energy, becoming lighter and shifting in so many ways that we may not be able to perceive but that we indeed can feel. It needs our dedication, love and respect, for it is our vehicle, while we live as humans. Becoming your own caretaker will also imply to create the healthy boundaries that will leave behind certain old ways or behaviours such as self-slavery, being the victim etc. for now you are conscious of your power and instead of looking outside for guilty ones, you know look within, take responsiblity and shift whatever situation that is disempowering you or simply wanting to force/manipulate you in a way. Be brave to leave the old - the old you. It is not helping you in the creation of what you truly desire. This is the reason why you may have anxiety, are sleepless at nights and probably some "diseases" have surfaced in your body that will vanish, as you begin to pay attention to what your body is telling you and take care of it. Loving and appreciating yourself - all of who you are - is essential. By doing so, you are honoring the way in which the Divine chose to experience itself through you. For this is never about us, but about All as One, manifesting a human experience to remember, again, who we truly are. This is a gift for us to prove, in the physical, the healers and masters that we are, in Essence. The choice to stand as one or continue to lower yourself, as always, is yours. During this New Moon and month, we have the opportunity to rebirth from the ashes of the old into the purity of our true being. The frequency from this Aries Moon, if wisely directed, can also be a fountain of great purification and rejuvenation. It is a time to use this inner fire to manifest those inner worlds that we nurtured in the ethereal, during the previous months, and use the magnificence of our inner light-power, within Divine Love, to project these soul desires in our earthly plane. This New Moon is also a cosmic reminder for us that it is time to master the masculine, the one who manifests, who protects and who honours what is tangible. Choose to trust in the Divine Plan, while you internally shape your creations. It knows you, for it is You. It desires for you to be in joy, for it is your natural state of being. And above all, it knows what is best for you. Surrender to the Divine Presence within. Remain in its Illumined, and Wise, Essence, knowing that you are loved, appreciated and valued, unconditionally.